Hearing about someone else’s marital problems is a guilty pleasure, but only until it becomes cause for envy. In her new book, Happier at Home, Gretchen Rubin shares the little things that bother her about her husband Jamie (who must be a really good sport to put up with this public laundry-airing). I liked hearing about how Jamie shares my husband’s tendency to ignore Rubin’s “bids” or her attempts to open up connection (from the “Body” chapter) and how he might have been less than enthusiastic about her taking on another project (though he doesn’t sound like the kind of guy to overlook the fact that his wife is a New York Times bestselling author). Yes, I do like hearing that other guys are not always their wives’ cheerleaders. I admit it. Shadenfraude, I’m a big fan. When I read women writers gush over how much help and support their partners were in their completing their books and achieving their dreams, I frown. Not gonna happen here. My husband told me it was simply not true when I told him I believed that even if I published a novel to great acclaim he wouldn’t read it. He apologized once for not reading the essays I wrote — about our my relationship with our child — in a breastfeeding anthology that came out this past summer. But that was two months ago and he still hasn’t read the essays. I know I can be only my own best cheerleader, but I continue to pine for more “rah rah” and enthusiasm from the man I married. And what really disturbs me is that it seems to me like the happier I am, the less happy he is. When I first went on antidepressants in 2001, my therapist warned me that the opposite might be true: that sometimes when a depressed partner started to come out of the fog and feel better, the other — who had been in a rough spot living with someone so difficult — might actually dip down into his own funk. She shared it not as inevitable but just as one of the many possible scenarios, and it turned out to be the one that fit us. Not in a super serious way, and not for really long. And since I was all drugged up, it didn’t bother me too much. Here we are, though, two kids and 12 years later. My body has gone through lots of challenges, and I’ve worked really hard to get well from the inside out in a holistic, lasting, sustainable way. Meds can’t be part of the picture anymore. I don’t even take Tyelnol. Along my holistic health journey, in order to be and stay well, I’ve had to eliminate lots of foods and make all my meals from scratch and to spend lots of money and time on complementary therapies. I used to be pretty damn high maintenance in terms of emotional and mental needs; now I’m high maintenance physically but a whole lot more even keeled in my head and heart. Even so, that journey feels kinda lonely sometimes. Now that we’re past a busy fall when I had a long-lasting respiratory illness and also two bacterial infections and then Christmas and then hosting my entire extended family at our house, hubby and I are falling back into normal. And that’s not looking so good. I’m finally feeling well, so I’m doing more than just cooking and caring for the kids; yesterday I went to my first Femworking meeting in the morning, and in the evening, I went to a yoga class, my first in 9 months. I was feeling happy and was acting cheery, I thought, but my enthusiasm was definitely not contagious. Now, it wasn’t a totally sucky day. There were moments of witty banter and smiles. But over lunch, I felt like my man wanted to be anywhere but with me and our kids. I checked in and got not much. He had no sparks or suggestions to get his groove back. I probably should have at least pushed him to take a walk around the block before I left for yoga. He did get that when he and the kids went sledding with the neighbors, but apparently ours got whiny and left early. Sigh. 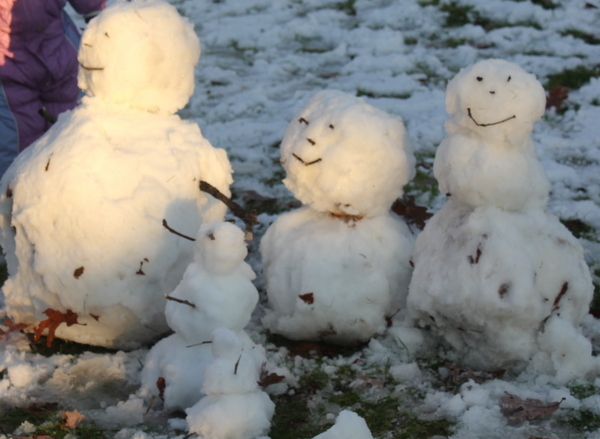 Is it just me, or is Daddy not having as much fun as the others? I came home feeling great from yoga and from having taken with me a friend who needed exactly that class and companionship. I shared my joy in what felt to my like an authentic sharing way, but I had the impression it was just rubbing salt in an ambiguous and mysterious wound. LJ stayed on the couch watching TV the whole time I made myself dinner and ate (while reading Happier at Home in preparation for this post). There was no animosity or hostility. Just not anything like infectious glee or the eye contact and smiling “That’s great; I’m so happy for you” that I craved. I do get those positive responses sometimes, but I also feel like the pattern of him withdrawing when I’m doing well is one that keeps repeating. Whenever it seems like I’m putting my energy outside the home with other people — even if the core reason I engage is to make myself feel good — it seems like my partner feels left behind. In these instances, the grunt-work part of our lives looms large, and I feel like every failing of mine with the house or our kids becomes a burden weighing heavily on him. After two months when I’ve been ill and not myself — when I even had to drive the short distance to the bus stop to pick up our kids from school and I did almost nothing fun — I didn’t want to start the year with me finally feeling good and then getting the impression that my upswing is at the expense of my husband’s happiness. I know I’m only responsible for myself and my happiness, and I know that I am the only one I can work on. Rubin’s book reminds the reader of this over and over, and of course she’s right. But what happens when I feel like my efforts are working on me and yet conversely moving in the opposite-than-desired direction in my partnership? And we do find ourselves on this rollercoaster, with one of us about to roll down a hill and the other climbing up, how can I cling to my good juju and not get bummed out that my partner doesn’t share it? Gretchen Rubin will be hosting a live chat on her Facebook page on Tuesday, January 7 starting at 1:00 p.m. on her Facebook wall. She will also be speaking at 6th & I Historic Synagogue on Wednesday, January 8 at 7 p.m. 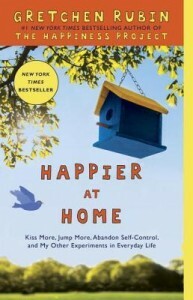 This post was inspired by Happier at Home: Kiss More, Jump More, Abandon Self-Control, and My Other Experiments in Everyday Life by Gretchen Rubin (author of The Happiness Project) in which she runs a nine-month experiment to create happier surroundings. As a member of the From Left to Write book club I received a free copy of the book for review purposes. All opinions are my own. Join From Left to Write on January 6 we discuss Happier at Home. I hear you…my husband doesn’t read most of what I write either. I tell myself that it might be because he’s not as comfortable sharing our personal stories as I am, but he doesn’t want to stop me from being me. A little rah-rah certainly wouldn’t hurt though! Thank you for writing such an honest post. Those “down” parts of the roller coaster are always the hardest especially when you’re not moving at the same speed as your spouse. Keep pushing through! I’ve been in that exact place too. Have you tried boosting him up with you? Like making daily compliments or encouraging him? I’m working on that now. I find this a LOT with mompreneurs. And, yes, in my own marriage. I think it’s partially a matter of my husband being frightened that I will succeed beyond him, in a line of work that he has no knowledge of. When our marriage was in a bad place, he said many things to undermine the work I’ve done. But we’ve worked hard on our marriage since my son was born and now he is much more supportive and a cheerleader for me. Still…he rarely if ever reads my blog! One thing I try to do is be more of a cheerleader for HIM. Give what we wish to receive? Thanks so much, Michelle! I’m sorry to hear about the undermining but inspired to know you’ve made it back from there … and to make another little one on the way! It helps to know he doesn’t read a lot. I’m curious how much he’s on board with the food. Yes, cheerleading rather than just projecting would be a better approach! Not my strength — with anyone — but I’m working on it! Thanks for sharing! I’ve started Rubin’s suggestion of making sure to give a kiss in the morning and at night and trying for “warm greetings and farewells” rather just just hi and bye. But I could certainly improve in the compliment department (and could have when I was a teacher, too. He’s not the only one to find me less than gushing!) Thank you for sharing! i’m glad to hear that you are feeling better! i love doing yoga also…it was great to get back into it today after traveling and having classes cancelled for the cold!